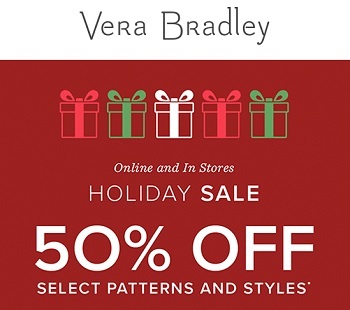 Enjoy shopping during Holiday Sale at U.S. Vera Bradley store locations and U.S. Vera Bradley online. You can get an extra 50% off selected styles. Free shipping for online orders of $75 or more. Source of the information is U.S. Vera Bradley. For more details about the offer visit any U.S. Vera Bradley store location or U.S. Vera Bradley online.